This is the fourth in the series of 'Feldbahnen' videos, covering 5 areas of Germany; North, West, Central, South, and East. 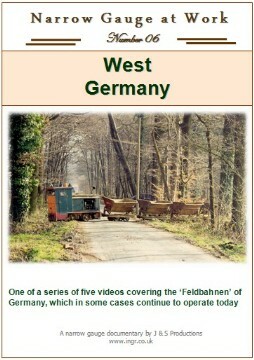 The whole series covers a total of 40 to 50 industrial narrow gauge railways filmed since 1997 up to 2003. The firms seen on this production include the following; Ziegelwerk Iking at Stadtlohne, Circel Kalksandsteinwerk near Haltern, Klasmann Torfwerk at Gross Heseper Moor, Grientsveen Torfstreu at Schöningsdorf, Emslandische Baustoffwerke at Surwold, Röben Idunahall in Schermbeck, and Torfwerk Weener at Esterwegen. Various other sites are also seen briefly including peat railways on the banks of the Küsten Kanal. On the banks of the Küsten Kanal, Torfwerk Weener has an old Schöma loco as the yard shunter. Torfwerk Weener uses a hydraulic side tippler to discharge the peat. The early morning sunlight highlights the train in the claypit from Röben Idunahall in Schermbeck. In Schermbeck again, the train shares a large road bridge to cross a canal and a river. Klasmann operates a large 900mm network near Meppen, and by Dalum there is an unloading point where the peat is discharged straight into waiting lorries. At least 2 peat companies tip peat straight into canal barges for transport on the Küsten Kanal. To the right of the picture above an extensive 900mm gauge system stretches out on the moors. At Surwold the Sandbahn serves sand pits for a large building firm. Many railways on this video were still operational in 2004, but Griendtsveen Torf at Schöninghsdorf is one railway that closed down a couple of years ago. The old Schöma loco assisted the 2 Diema locos hauling the peat trains back from the moors at Griendtsveen Torf. Another sand railway still existed near Haltern, and the sand was loaded from an overhead hopper. The Diema loco of Ziegelwerk Iking carefully makes its way back to the brickworks with a loaded clay train. The skips are pushed out to the pit at Ziegelwerk Iking, seen here crossing a minor road. One of the large Diema locos on the 900mm gauge Klasmann network seen here at Dalum.